Are you as successful as you want to be in your business? For many, the answer is yes, I have some success, but more would be great. That’s because there’s probably more people you’d like to help, more customers you’d like to bring on board and more you’d like to achieve. Because when you’re helping more people it means you’ll be making the difference you want to make in the world. So the question is why? Why aren’t you more successful – when you are so focused on achieving the next level of success in your business and your life? Why are you still not getting to where you want to go? 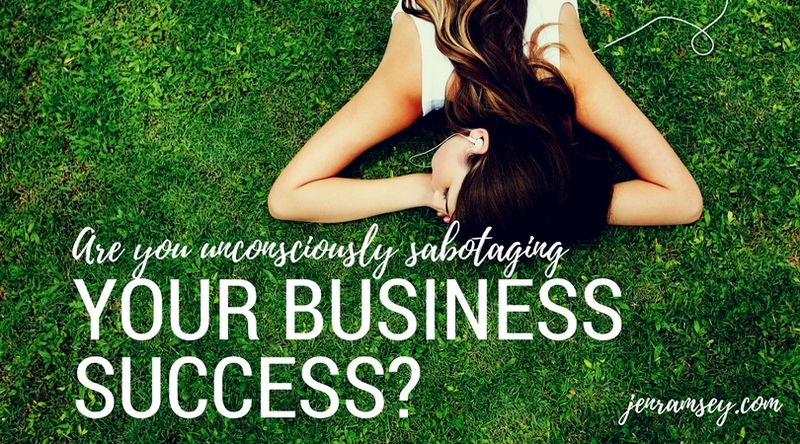 The fact is that at the subconscious level we can often sabotage our business even when we have the best of intentions. There are things that we’re thinking and doing, that can really be damaging to our success. If you’re ready to move your business forward in a very elemental and profound way then read on. So what are these things we’re doing subconsciously and what can we do about them? The first thing is to recognise there are potentially negative stories and voices in our heads that are so ingrained and so much a “part of the furniture” that we often don’t hear them at all. On the other hand, you might find these voices are quite loud and persistent – like sharks in the water, they circle around and around waiting to pounce any time you let your guard down. We also need to be careful about the false thinking around the power of positive thinking and affirmations. Often we’re told we should just focus on our affirmations and ignore those voices. The problem with this is that suppressing the voice and ignoring it makes it worse, much worse. Whatever situation you find yourself in – the only way forward is to deal with those inner voices and the beliefs lying underneath. So how do we do that? Just listen carefully to what you are really saying. And listen out for the core themes your voice is telling you. If you are busy, “always on the go” person you may need to go into meditation or some form of silent space to hear what you are saying to yourself. 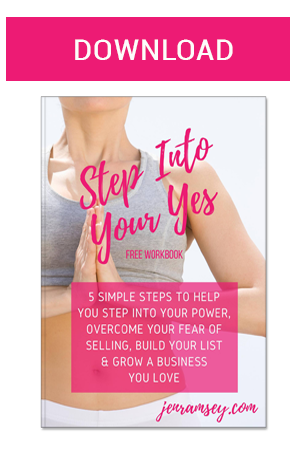 This is a really important step as this negative voice inside is the voice that will corrupt your business, and your life if you don’t deal with it. Now, this idea of speaking back and challenging the voice might feel really different – and in complete opposition to the training, you probably received as a child. I’m not sure about you, but I was told very clearly, many times: “don’t speak back” or “don’t back chat me”. In this instance, that training is not going to help you. In fact, I want you to do the opposite – you need to start talking back to this voice. Because this voice is damaging and insidious. It’s not helping you long term in your business… it’s actually a voice that can take you under. I look at the impact of that voice in my life and I cannot begin to tell you how damaging it has been to me personally and professionally. It has stopped so much good in my life. Listen to what it says and start listening to everything that is the opposite. You need to reprogram yourself and it starts here. If you need to, take out your journal and list all of the ways you are good enough or smart enough. Write down everything that is the opposite and keep them as evidence so when you hear the voice flare up you can go to your list and get the facts. The voice can be torturous – so speak back to it. Would you let others speak to your child, partner or best friend like that? No way! So become your own best friend and defend yourself. Remind yourself of ALL of the positives you have achieved down in your business and your life. Keep focused on these things. Quantum physics tells us that what we focus on we will manifest. So if we have been focusing on “not good enough”, “not smart enough” or “not fast enough” that is what we will get in life. It’s vital to keep focused on those things that we desire and choose rather than what we don’t want. Let me know in the comments below how you go with this little process. If you want more tips and inspiration like this join my FB Group – Fearlessly Authentic, Focused and On Fire here. Every week I do a Facebook Live Q&A where you can ask questions about the things bothering you most. I also regularly offer workshops and trainings to help you manifest and market a business, and life, you love! Join me here – I promise you lots of fun and lots of tips to expand your business.